Select-A-Shield™ High Attenuation RF Shielding Signal Security Tent Certified in Independent Testing. Canandaigua, NY USA: -98.9 RF signal reduction for a Select-A-Shield portable tent enclosure has been certified in recent testing. Results include -98.9 dB average RF signal shielding at commonly used cellular and Wi-Fi frequencies of 800 – 2400 MHz and minimum signal attenuation of -85 dB over a range of frequencies of 30 MHz to 10 GHz. Select-A-Shield collapsible and portable RF shielded tents are manufactured in the USA by Select Fabricators, Inc. The complete Select-A-Shield RF Signal Security Tent system includes an RF shielded vestibule which allows for entry and exit without compromising the RF shielding integrity of the enclosure. Installed components include the vestibule, SELECT’s single door, double magnet seal door system (US Pat. No. 9,029,714), high-performance ventilation, built-in connector panel with filtered power connections, lighting, and a shielded floor. The collapsible High Attenuation RF Shielded Tent assembles and disassembles in a little over one hour, and is economical to ship and store in lightweight, durable transit cases. Construction of a complete High Attenuation RF Signal Reduction Tent system starts with the USA produced Nova Select™ fabric consisting of electroless plated silver etched directly onto ripstop nylon fabric fiber. Copper and nickel layers are then electrolytically plated over the silver along with an outer protective coating for durability. All openings in the RF Shielding Portable Tent must be completely sealed during operation to attain maximum shielding effectiveness. Select Fabricators’ uses its patented double magnet doors to seal off the entryways for RF isolation with the conductive fabric used as a gasket to attain signal reduction. 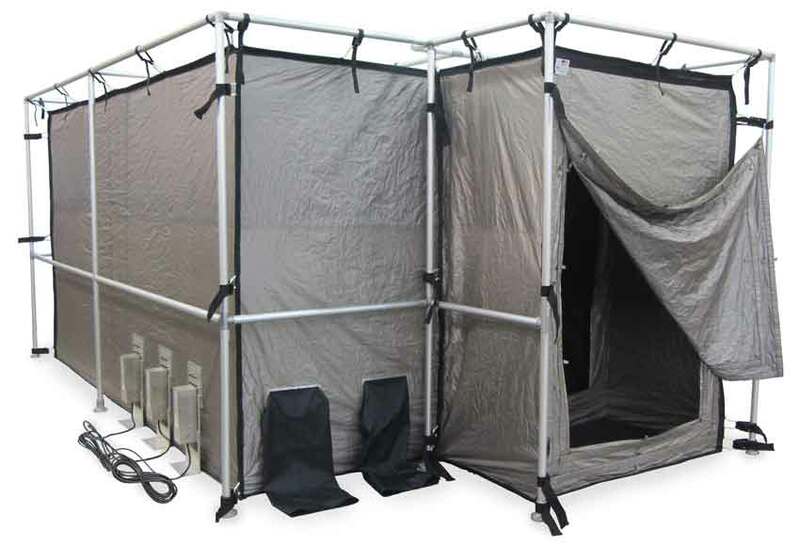 The secure communications High Attenuation RF Signal Reduction Tent can be made with an interior vestibule which is constructed using the patented single door sealing system in the interior of the tent’s footprint. This RF shielded vestibule allows for entry and exit from the main chamber without compromising the RF shielding integrity of the tent. Vestibules are configured to customer requirements within the interior part of the tent. Founded in 2000, Select Fabricators, Inc. is the premier US manufacturer of RF portable, collapsible fabric shielding solutions including signal reduction enclosures, pouches, and curtains; as well as the procurement of state-of-the-art materials, research, design, manufacturing, fulfillment, compliant production to stringent quality standards and complete project management. RF isolation is one part of a complete secure communications protocol. Please make sure your operation is in compliance with all sections of the protocol.